This course has 9 mandatory units which are relevant for all three of the above pathways. By doing this course online, you can study when it is convenient for you at your own pace. Throughout this online course, you will be provided with excellent mentor support from our experienced team of tutors/assessors. Learners will also have access to our online study platform, reading and study materials, recommended books, tutorial videos, and full guidance on writing assessments (portfolios). Also, you will have access to an online forum for communication with your mentor and other learners who are doing same. Studying with Global Edulink has many advantages. The course material is delivered straight to you, and can be adapted to fit in with your lifestyle. It is created by experts within the industry, meaning you are receiving accurate information, which is up-to-date and easy to understand. This course is comprised of professionally narrated e-Learning modules, interactive quizzes, tests and exams. All delivered through a system that you will have access to 24 hours a day, 7 days a week for 365 days (12 months). An effective support service and study materials will build your confidence to study efficiently and guide you to secure your qualification. Who is it for? This qualification is designed for those either working or hoping to work within Health and Social Care sector in a variety of roles. Course Description Each unit within the Diploma has a credit rating. 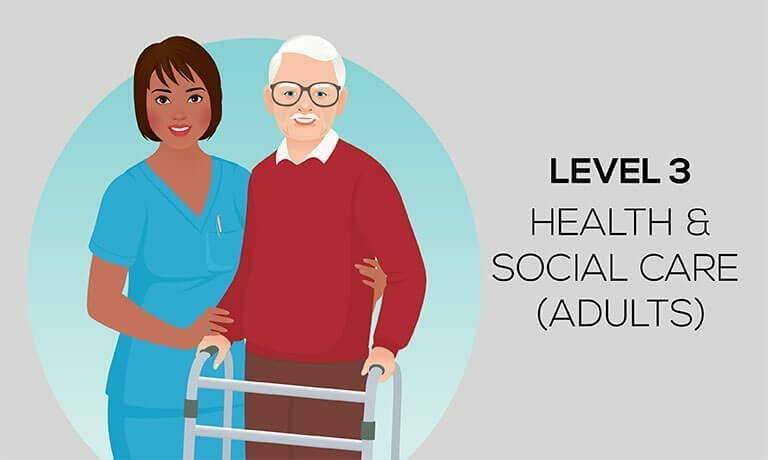 Learners must achieve a minimum of 58 credits to gain the Level 3 Diploma in Health and Social Care (Adults) for England. 28 credits must be achieved from all nine mandatory units. Optional Units Depending on the area of work you are hoping to go into, there is a vast range of optional units as well as the mandatory ones. It is important to note that optional units need to be specific to each learner to ensure that their job role and work context enable them to meet the assessment criteria and requirements of the unit. How this Qualification is delivered? This is a vocational qualification with between 315 and 447 guided learning hours. 100 per cent of this qualification focuses on the development of your skills and knowledge, supporting your progression within or entry to work in the Health and Social Care sector. There are no specific entry requirements for this course, but you may find it helpful if you have already achieved a Level 2 qualification within the Health and Social Care area. Basic understanding of English language, literacy, numeracy and ICT are required for this course. Method of Assessment As this is a competence-based qualification you will be assessed in a real work environment – therefore you will need to either be working, or have a work placement within a Health and Social Care environment (there is no set time for placements, so you will need to have completed sufficient hours and have developed some evidence and skills). Certification Successful candidates will receive a Level 3 Diploma in Health and Social Care (Adults) for England (501/2263/0) from NCFE, an awarding body within England and Wales who are currently recognised by Ofqual and the Department for Education and Skills. What will gain through the course? You will develop your skills by working and supporting people in a range of situations, and assisting them in daily tasks. You will support people by meeting their healthcare social care needs and requirements. You will also be able to promote a person-centred approach, communication, and good practice in handling information within Health and Social Care settings – with the expectation that you will promote and implement health and safety and equality and inclusion in your own role. Development of these skills is supported by underpinning knowledge, covering safeguarding and protection and implementing duty of care in your workplace. You will actively engage yourself in your professional development and agree a personal development plan to identify areas for your own learning and development – recording your progress on your development plan and reflecting on your progress against it. Assignment Submission Assignments (Portfolio) are submitted electronically (online) via your online study platform.